The design process is easy and begins when you contact us by phone or send us an email to avibrantwedding@gmail.com with your name and a brief description of your celebration. A Vibrant Wedding will then follow up with you to schedule an appointment for a complimentary consultation either by phone or in person. Generally, you want to contact us 3-4 months prior to your event for custom invitations. We understand that this time frame is not always possible and will be happy to assist you with any rush orders. During our consultation, we will discuss your theme, colors and any ideas you may have to help make your concept design come to life. You are welcome to provide us with any pictures, swatches or clippings that will help translate your concept. You will also have an opportunity to view our current portfolio, paper colors, embellishment options and all invitation suite styles for inspiration. After you have selected your invitation style and initial design, we will provide you with a cost estimate and project time schedule. If your not local, our Envelopments paper line and samples can be viewed nationwide at a stationery store near you when you provide us with your zip code. After accepting the estimate and providing 50% deposit retainer, we begin designing your digital mock-up proof. 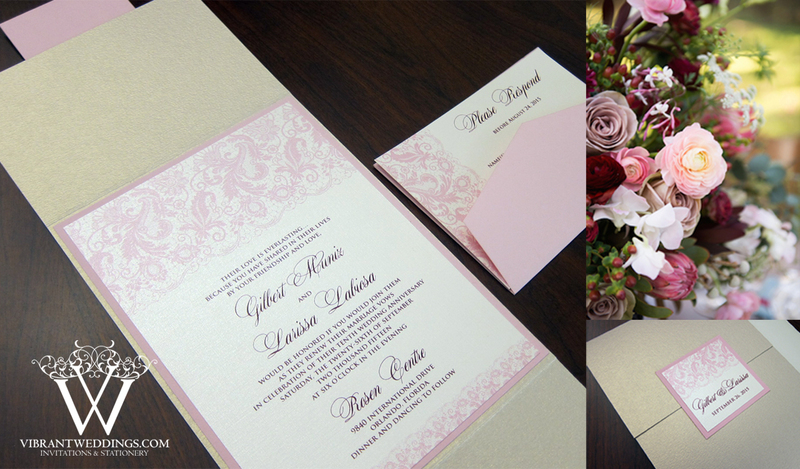 We will then contact you and gather all event details, wording, and any other design ideas for your invitation. A digital proof design will be emailed to you for your review and revision in PDF or JPG format. After making the necessary changes, we will then ask you for your “Final Approval” to proceed to the production phase. After approving the Final Digital Proof, the remaining balance is due and your custom paper order is then placed so we can begin production. Once we receive your custom paper order, we can begin the printing and assembly process. Depending on the complexity of your design, both the printing and assembly process generally takes between 4 to 6 weeks after your approval is given. We understand that this time frame is not always possible and will be happy to assist you with any rush orders. Once your order is finished, we will contact you for pick up. If you will not be picking them up in person, shipping arrangements can be made and all shipping cost will be included with the remaining balance due.